“Bulletproof” SBUX… Guaranteed to be able to sell at $50 until October no mattter what. …not only does Steve have zero cost basis for his $50 ‘stock insurance policy’, but he’s also reduced his cost basis on the stock! Okay so I had a conversation last Friday, June 1 with my client and friend Steve S. Elsewhere on this blog, you’ll find a post titled, “Bulletproof… FOREVER” . In that post, I documented a “fence” that I helped Steve to build around his Starbucks stock. Steve’s stock was up from where he had bought in. By doing a combination of plays he was able to capture a credit and completely BULLETPROOF his position as of last Friday. 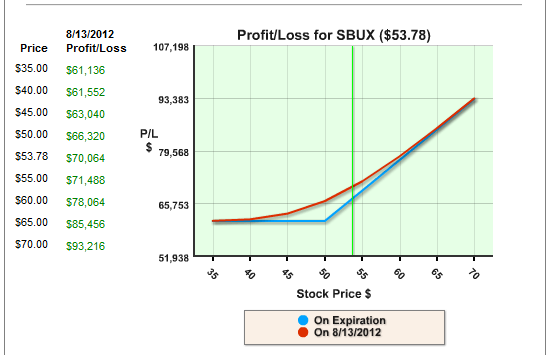 Steve has 1600 shares of SBUX that he got years ago at a cost basis of $12.50 a share. I spoke to him about using an in-the-money, far-out-in-time put option to protect the gains that his stock has made. While this addition locked in the gain his stock has made, it did cost him a little bit of money out of pocket… at first. He’s glad he did it. Steve was able to keep a cool head while his stock plummeted over the last few weeks. But here’s something even cooler… Along with the protective put, we also implemented a near-term “nested spread trade “. That is, rather than simply hedging the stock with a put option, we also did a near-term play to capture credit but again without limiting the upside growth potential. Steve’s “Income Method #6″ play was composed of 16 bear call spreads, nested within the married put play in such a way so as to make the spreads riskless. That is, if SBUX went up, causing his bear call spreads to go against him… his gain in the stock would more than offset the possible loss from those spreads. Because Starbucks has gone down since April, Steve was able to capture credit from those nested spreads and apply that income to the cost basis of his put options. Not shabby! …the October $50 puts continue to protect his 1600 shares of SBUX. But now it’s like he’s been paid to do it! Steve took the October $60 puts and sold them, while at the same time buying an equal number (16) of the October $50 puts to continue to protect his 1600 shares of SBUX. But now it’s like he’s been paid to do it! This is shown by the fact that now, Steve’s net cost basis for the stock AND the $50 puts… is lower than his cost basis for the stock itself was in the first place! Pretty cool, right? I’M impressed with this move. So now Steve has nothing out of pocket… has reduced the cost of his 1600 shares from $12.50 apiece to $11.98 apiece… has a guaranteed exit at the $50 level in case of catastrophe. Perhaps I should mention that SBUX also paid a dividend of .17 cents on 5/25. bringing the cost basis down even further to $11.81. Nice going, Steve! No cost basis for the $50 put… it has been paid for. The very best part is that right now, Steve and I are collaborating on Income Method #11. I can’t talk about that here, it’s reserved for Fusion subscribers. But I think Steve is going to have another happy, happy trade by this July expiration. Watch this space, I’ll fill you in on at least some of the details. Thank you for the information, I bought the blueprint recently. I don’t understand how rolling the put down from 60 to 50 helps unless he simultaneously used another income method such as selling a covered call close to the 50 strike price to milk some more premium. It seems he gained $ 5.75 profit but gave up $ 10 in insurance if the price of the stock at expiration closed below 50. Rolling the put down jives with Steve’s sentiment regarding the stock. He believes that SBUX will return in the near term, bouncing off of support in the $50 range. I dunno if he’s right or not… shucks, my sense of stock timing is NOT a good barometer, EVER… but this is his sentiment. Therefore! If SBUX is bouncing off of $50, will Steve do better holding a $60 put or a $50? With a $50 put his net value will increase more dramatically than if he continues to hold the $60 put. And, since his cost basis is so daaaang low, he’s actually doing pretty good taking a credit that subtracts even from that! Bottom line: I might not want to roll down a put… that’s not something I often do… but in this situation I think Steve is right on. Especially since we are experimenting with Income Method #11 on this. It’s kinda top secret now. I can let you know more about that later. Hope that answers your Q, Mark! Keep tabs on this space, I’ll let you know soon how Steve’s play… or a fascimile thereof… goes. While you have successful formulas, most brokers will not let inexperienced traders trade them. Truth is you must already have a significant account to trade like this. Yeah… so? 😉 Lots of folks that own The Blueprint are qualified to do all of the Income Methods. But to let you know… it’s been my experience that once traders begin asking their brokers tough questions (“Why CAN’T I do a bear call spread in the context of a married put? It has less risk either way than a collar… do you just want a commission for me NOT to protect myself?”) …the brokers normally start to add to their trading clearance. how to get the whole bulletproof method ? Hi Muhamad: Just purchase The Blueprint or The Home Study Kit! http://www.radioactivetrading.com/store/main.aspx They both include our teaching on the entire method of trading.